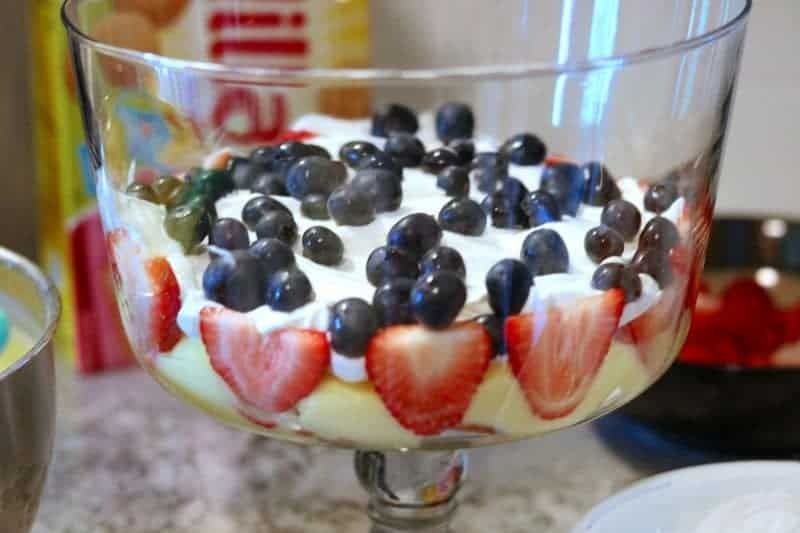 A red, white, and blue berry trifle recipe made with fresh berries, NILLA Wafers, vanilla pudding, and frozen whipped topping. 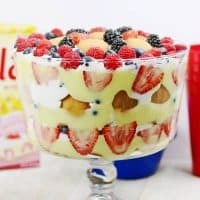 This easy trifle recipe makes a great no-bake summer dessert and is perfect for patriotic holidays such as Memorial Day, 4th of July, and Flag Day. Turning on the oven in the summer is no fun at all, so I like to avoid it at as much as possible. 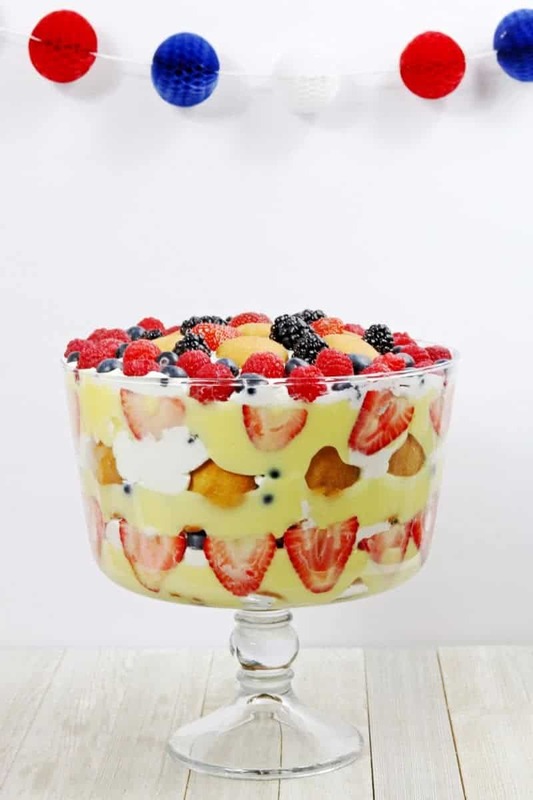 That is why I love no bake summer desserts like this red, white, and blue berry trifle. Trifles are perfect for entertaining, and are the kind of dessert that always end up being the talk of the party. They look beautiful displayed on the dessert table and taste amazing too. Considering how easy they are to make, trifles really are the perfect no-bake summer dessert recipe. Get ready to make your berry trifle by gathering everything that you will need. We used the original variety of NILLA Wafers for this recipe, but you could use Lemon NILLA Wafers instead. Either way, I am sure your trifle will be absolutely delicious. You can use the fresh berries of your choice for this recipe. To get the desired red, white, and blue effect I would recommend using strawberries and blueberries, and adding any additional berries if you wish. We used 1 tub each of strawberries, blueberries (large size tub), raspberries, and blackberries. Remember to allow your frozen whipped topping to thaw before making your trifle. Place the whipped topping into the refrigerator at least 4 hours before you will want to begin preparing your trifle. I like to put it in the fridge the night before just to be safe — and so that I don't forget in the morning. Assembling your berry trifle is not only easy, but it is fun as well! Trifles are the type of dessert where you can let your creativity shine through. Start by rinsing all your fruit and allowing it to dry. While your fruit is drying off, prepare the vanilla pudding by whisking together the pudding mix and milk. Allow the pudding to set a few minutes while you slice up your strawberries. I sliced most of my strawberries thinly so that they would look nice pressed up against the glass in the trifle dish. I cut a few of the smaller berries in half to use to decorate the top of the trifle. Okay, now starts the fun part! It is time to start assembling the layers of your berry trifle. First, cover the bottom of the trifle dish with NILLA Wafers. Then, add a layer of pudding. Next, add a layer of berries. 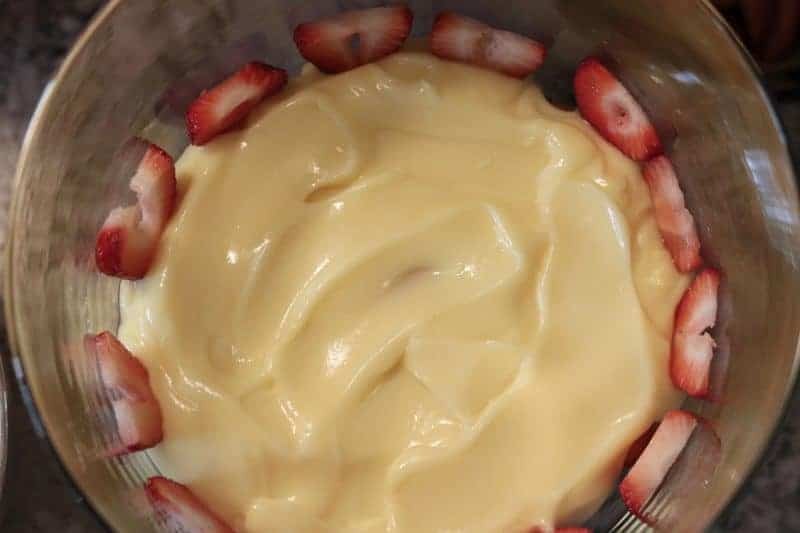 I pressed a few strawberries down into the pudding so that they would press up against the glass all the way around the dish. Now add a layer of whipped topping and then some more berries. Follow with another layer of tasty NILLA Wafers. Continue adding layers of fruit, pudding, and whipped topping, being sure to end with a layer of whipped topping on top. 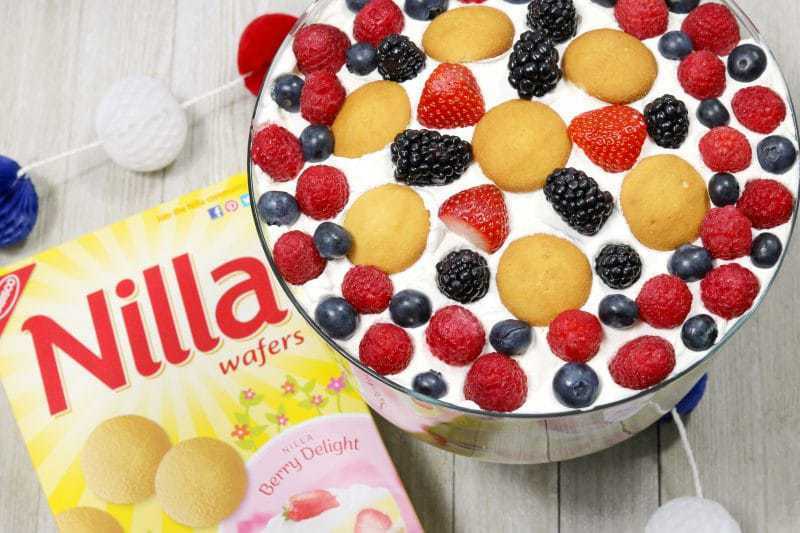 Use your fresh berries and a few additional NILLA Wafers to decorate the top of your trifle. You can be as fancy or as simple as you would like here — it is really up to you. Have fun with it! 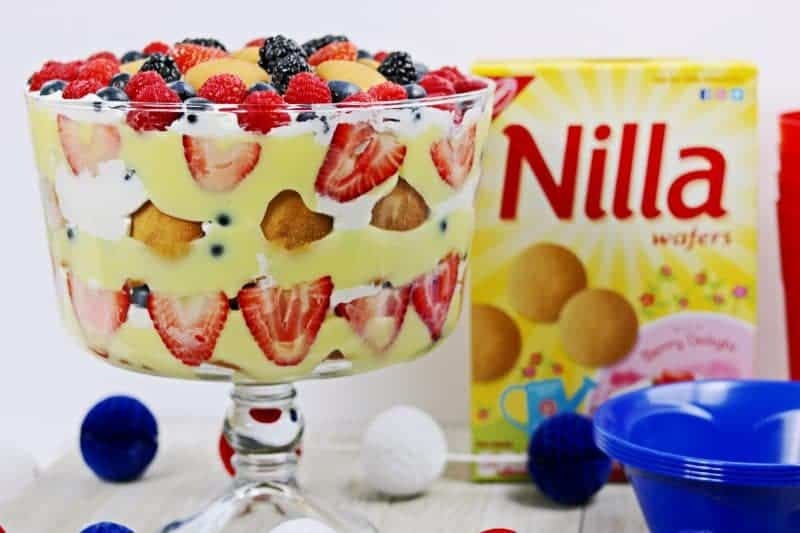 While I used the original variety of NILLA Wafers in today's recipe, next time I make a trifle I think I will try pairing Lemon NILLA Wafers with Raspberries for a Lemon Raspberry Trifle — doesn't that sound amazing?! NILLA Wafers are a perfect ingredient for no-bake summer treats such as pudding pies, icebox cakes, cookie sandwiches, mini ice cream sandwiches, and trifles like this one. With NILLA Wafers the possibilities really are endless! 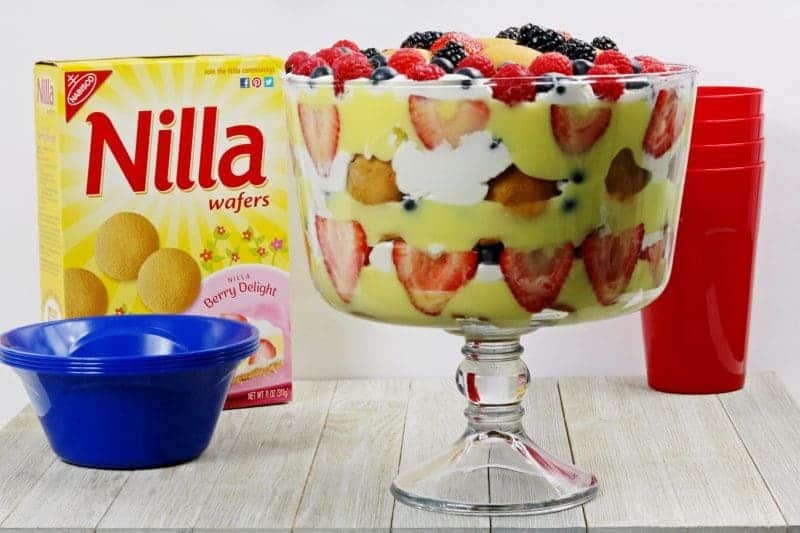 Be sure to pick up a few boxes of NILLA Wafers at Walmart so that you can whip up some no-bake desserts this summer. 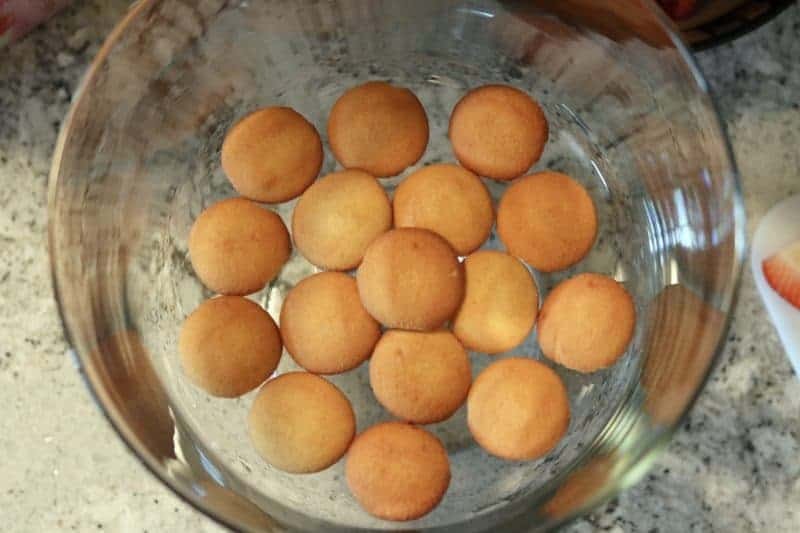 Find more tasty NILLA Wafer recipes here. 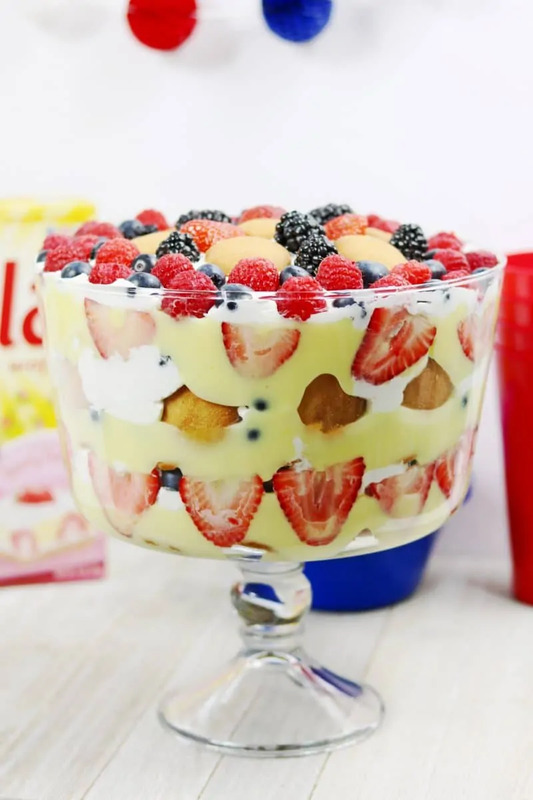 A patriotic berry trifle made with fresh berries, Nilla Wafers, vanilla pudding, and frozen whipped topping. 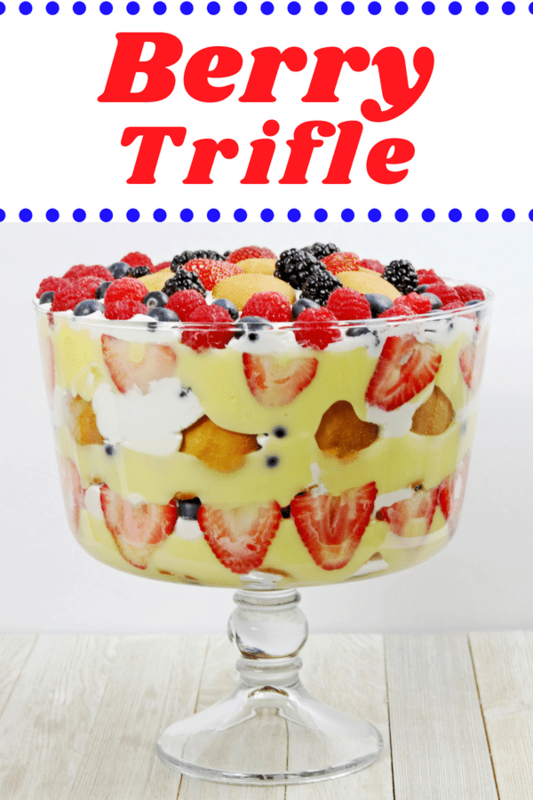 This easy trifle recipe makes a great no-bake summer dessert and is perfect for patriotic holidays such as Memorial Day, 4th of July, and Flag Day. In a large bowl, whisk pudding mix and milk together for 2 minutes. Refrigerate for at least 5 minutes to allow to set. 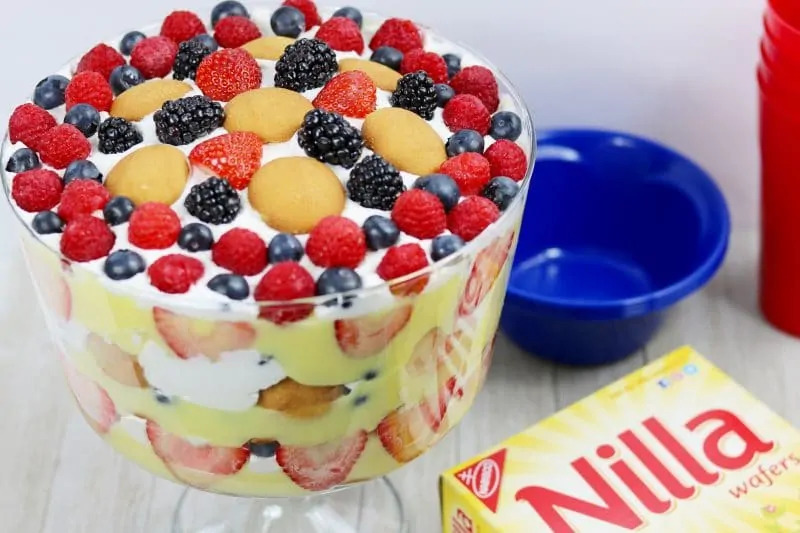 Layer NILLA Wafers, pudding, berries, and whipped topping. Repeat layers, ending with a layer of whipped topping. 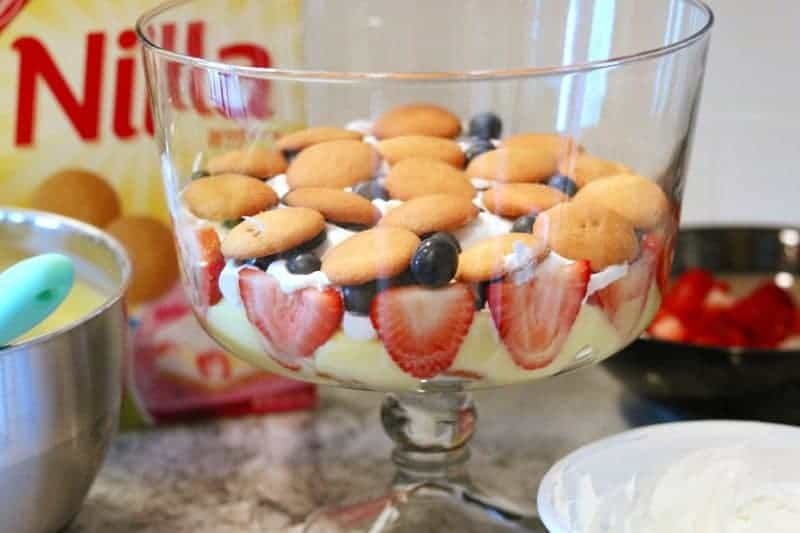 Garnish top of trifle with fresh berries and NILLA Wafers. Looks tasty! Can’t wait to try this. This recipe sounds great and looks delicious. Thanks!